On the shelves of Community one can find the latest pop record album produced by an Athens musician, a vintage denim jacket embroidered by hand with new thread and jewelry made by a friend or neighbor. In addition to teaching sewing classes and performing alteration services, Community supplies prints, postcards, chocolates, t-shirts, soaps, bath bombs, beard oil, fruit preserves, music, honey jewelry, candles, tea and more all made by local artisans. 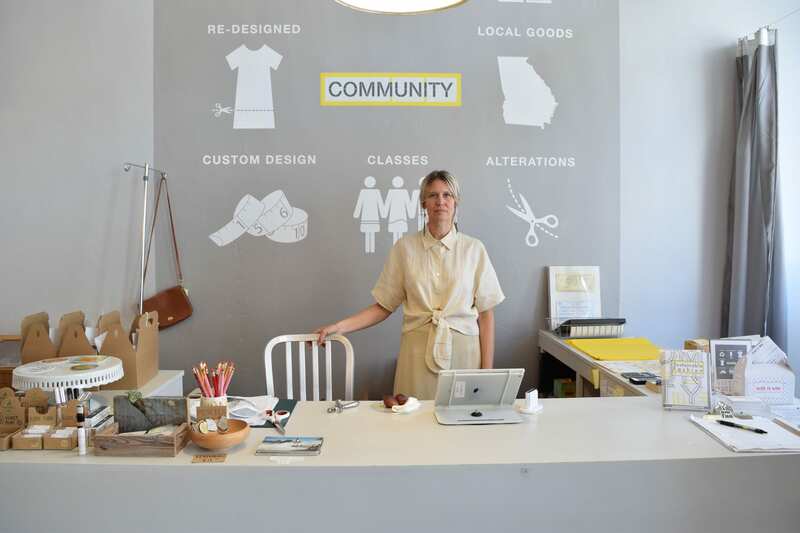 For six years, Community has carefully curated items that are exclusively made in Georgia, mostly in Athens, to promote sustainability and support local artists, selling them in-shop in downtown Athens. Why It’s Newsworthy: Community gives shoppers a chance to buy local products like handmade blue jeans, organic soaps and sauces, and tea grown in a student-founded garden, supporting business owners in Athens and helping the community by spending dollars that go back into the town. 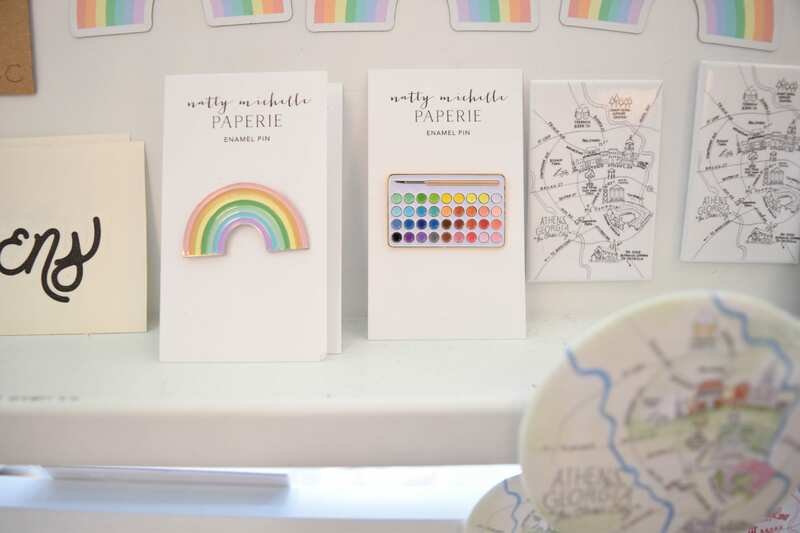 Hailing from Germany, founder Sanni Baumgärtner first came to Athens in 1997, and discovered a hotbed of talented artisans with nowhere to sell their independently-made products. For artisans in Athens who cannot afford a brick-and-mortar store to sell items, they can turn to Community. “Buying local” has become a trendy phrase in recent years as businesses nationally make the push for consumers to purchase items from small or local shops instead of large corporate companies. Since 2002, studies have quantified the local economic benefits delivered to communities by independent businesses. 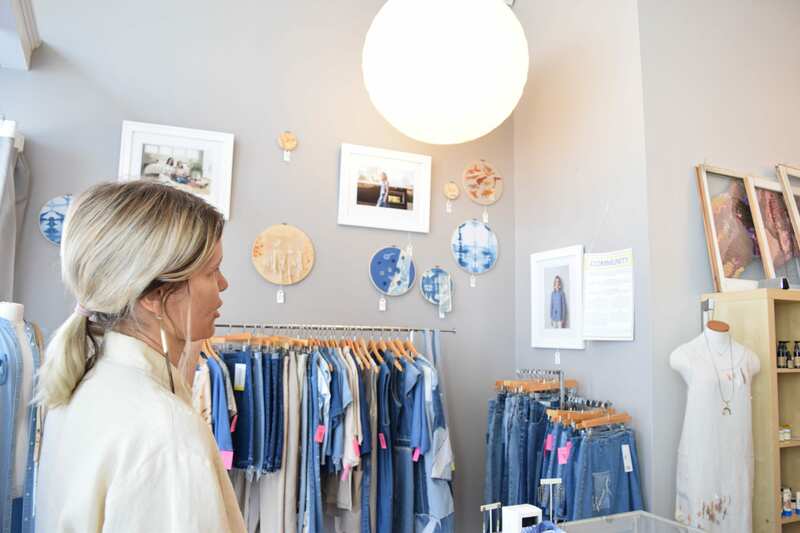 The American Independent Business Alliance says locally-owned and independent businesses return much more of each dollar in revenue to their communities than chain stores do, creating a cyclical economy that benefits both buyers and sellers. On the shop’s shelves are handmade clothing items, often created from repurposed vintage fabrics, including the store’s own clothing line Community Service. “By taking a vintage piece and redesigning it, it’s less material and labor cost than starting from scratch, and it’s more environmentally friendly,” Baumgärtner says. As part of the Athens Fashion Collective, Community also plans multiple annual fashion shows, inviting collaboration between Athenian designers. In addition to the Community Service line, shoppers can find Jen Cole’s designs from her company Staghorn Works. All of Cole’s pieces are crafted from hand-dyed, raw silk, in a process that can sometimes take multiple days to set. Cole uses foraged materials like dog fennel, maple leaves, black walnut hulls, eucalyptus leaves, staghorn sumac seed pods, rusty nails and even avocado pits and black bean-steeped water discarded by Mexican restaurants. This gives Cole low-impact dyes in vibrant blacks, browns, yellows and what she calls “ballet pink” from the avocados. 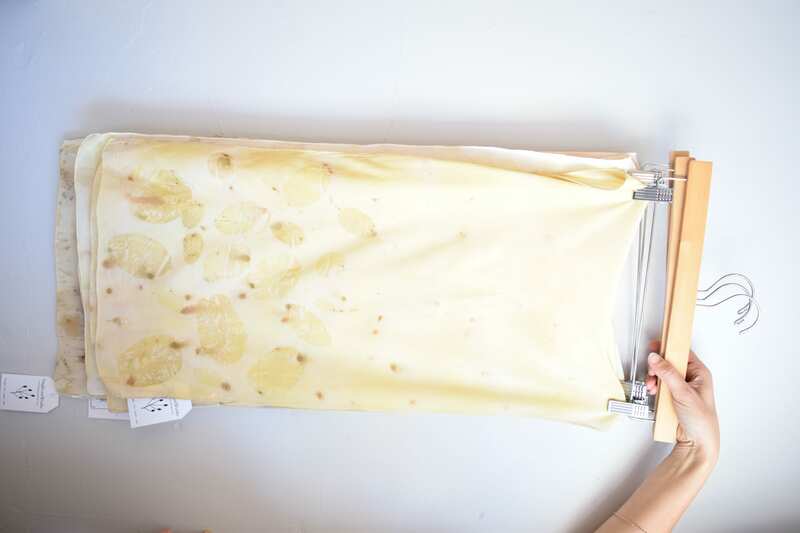 These reused materials then go toward coloring the fabric to make into tops, dresses, skirts and silk scarves. Described as a “very steep learning curve,” many of her sewing skills come directly from a class she took through Community that drew her into the garment-making process. Another brand of clothing created sustainably and locally that Baumgärtner stocks is Whiskey Stitched. 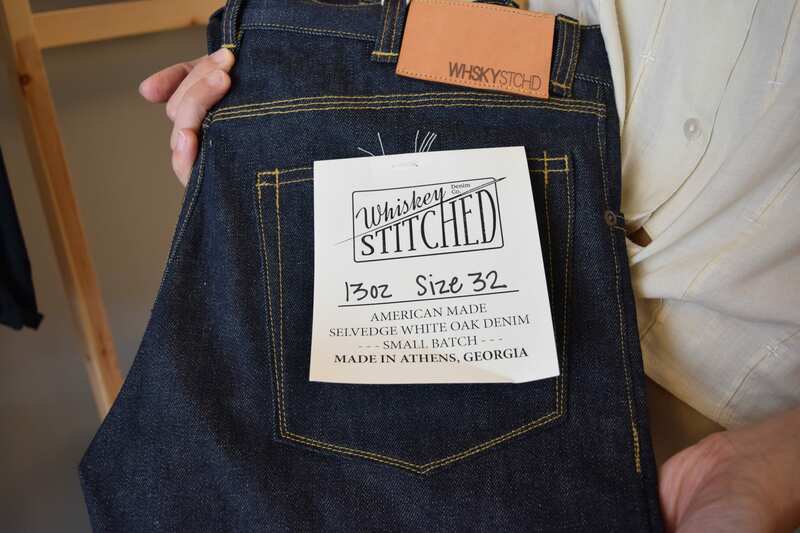 Revitalizing the once prosperous denim-making industry in Athens, Whiskey Stitched makes small batches of handmade White Oak denim in jeans, shirts, aprons and more. Baumgärtner explains that no company in Athens has produced locally-made jeans in more than twenty years, but the practice has historical roots in the Classic City. Beyond clothing Community also carries several brands of health products that are made locally, sustainably, and often organically. Customers can buy rugged soap bars from Normal Soap Co. and boxes of healthy shaving supplies from Chalises in an effort to buy products free from artificial dyes and colors. 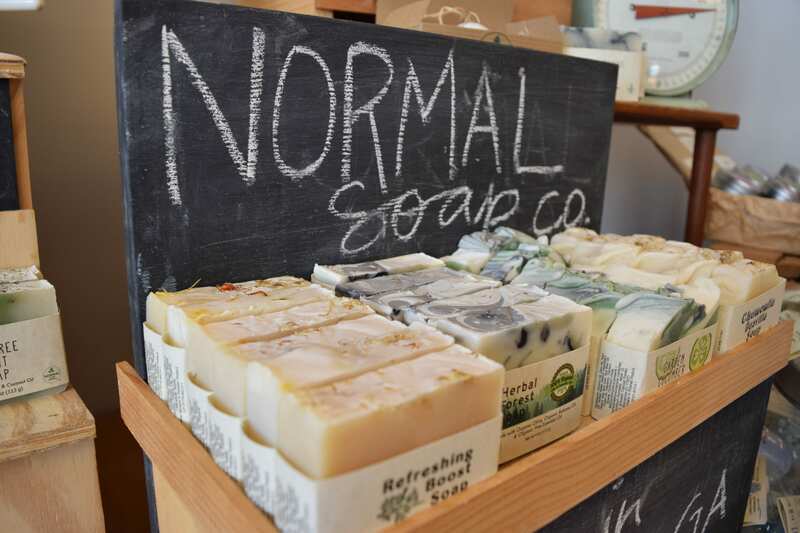 Normal Soap is the brainchild of a fourth-generation soap-maker, an all-natural soap and body product company based in Athens, and one that Community has carried since opening in 2012. 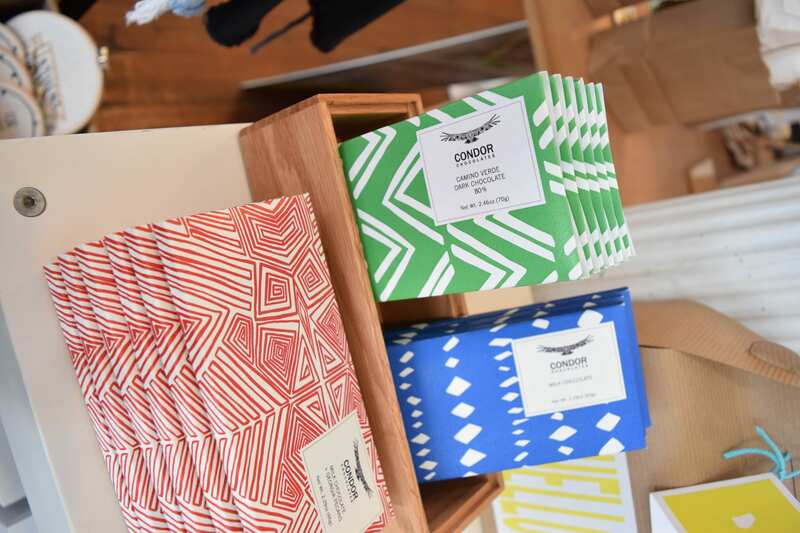 In addition to soap inspired by everything from local brewery Terrapin’s Hopsecutioner beer and tobacco bay leaf, Normal Soap also produces vintage-inspired shaving kits, shower steamers and bath bombs. Natty Michelle Paperie from Bishop, Georgia features the Classic City’s most famous features drawn in detail on stationary, home goods and notebooks. Eagle-eyed buyers can spot the UGA Arch, Sanford Stadium and The Tree That Owns Itself. Magnets and pins sit on a display shelf at Community in downtown Athens, Georgia on August 25, 2018. Representing the university community studying only a few streets away, Community carries selections of teas from the UGArden, a community farm centered on sustainable farming. Aimed at teaching organic practices, improving health and building community, UGArden sells many types of herbal oils and medicinal teas grown from ingredients farmed by volunteers. The medicinal branch of the garden, which sits on Milledge Avenue, was founded in 2012. Their teas tout medicinal properties ranging from allergy relief, “blissful belly,” memory improvement and soothing stress. 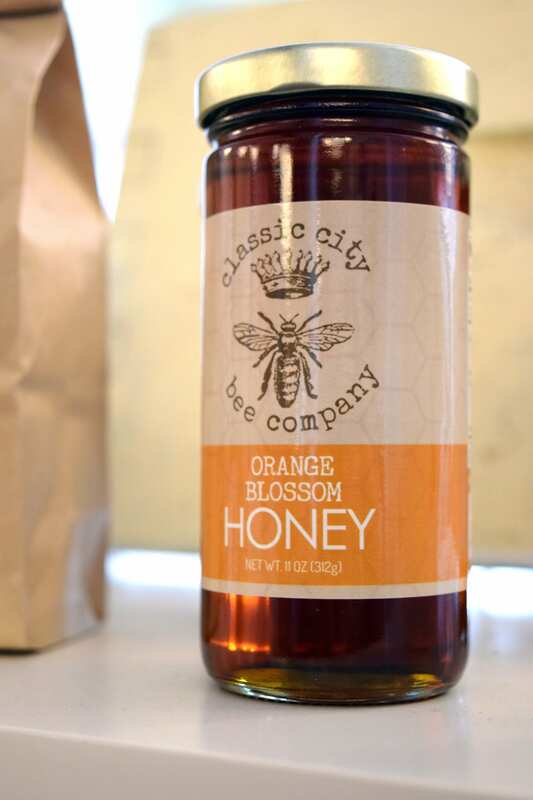 The Classic City Bee Company carries several varieties of its honeys in Community, including monofloral honey created by bees visiting a single type of flower – like clover or wildflower – as well as flavored honeys. Other edible products found in Community’s curated collection include small batch preserves, jam, mustard, pickles, vinegar, shrubs and “all things saucy” by hand using regionally sourced, organic ingredients. 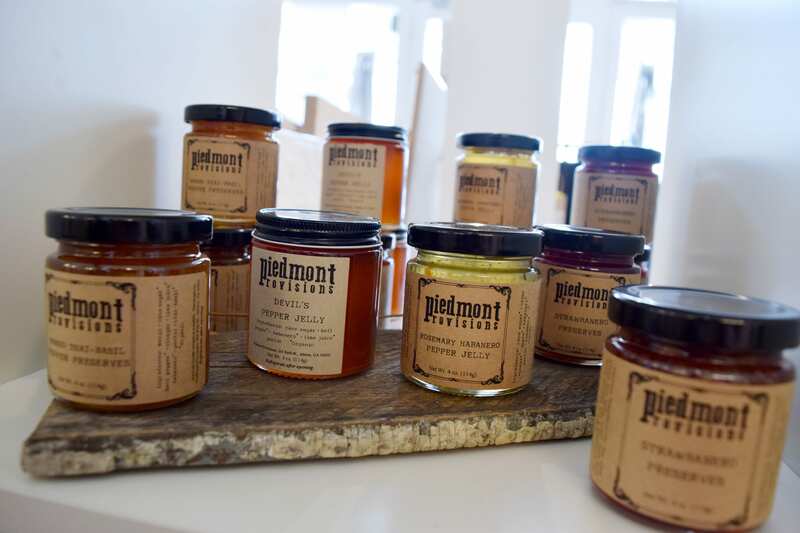 Piedmont Provisions, the local manufacturer of these goods strives to grow most of its own herbs, peppers and ingredients, sourcing the rest from Georgia-based farms in order to support local growers and back organic and sustainable farming. 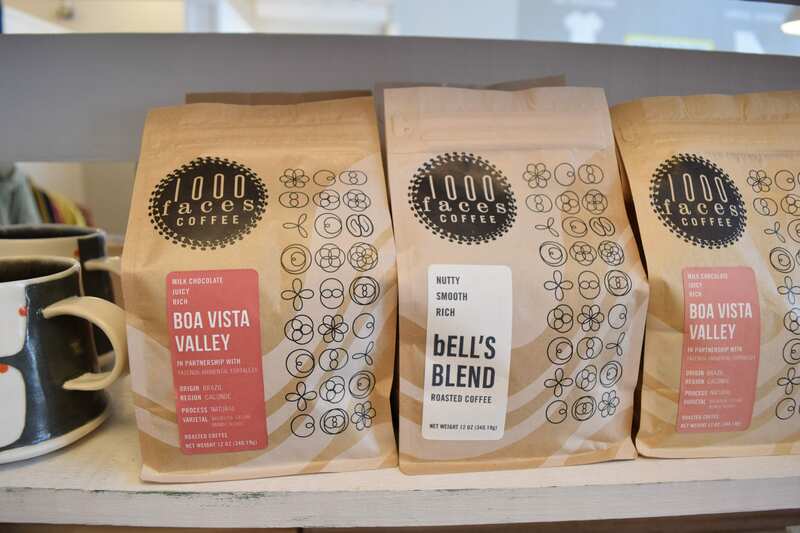 1,000 Faces Coffee has served the Athens community with locally roasted coffee, available to purchase in their café and on Community shelves. The shop’s coffee selections are described by their flavor profiles, and include information about the nations and individual farms where the coffee beans are harvested. In addition to coffee Baumgärtner says she wanted Community wanted to sell chocolate. The opportunity came about in 2014 when Condor Chocolates moved to Athens’ Five Points neighborhood. The company is recognized for using the specialized method of chocolate production and distribution known as bean-to-bar. Condor Chocolates is one of only three locations in Georgia that uses this method. Chocolate bars sit on a shelf at Community in downtown Athens on August 25, 2018. Condor Chocolates sources cacao from Ecuador and ingredients like milk and pecan from Georgian farmers. Similar to 1,000 Faces, Condor sources its beans sustainably to try and build relationships with farmers. The company traces its beans to specific, usually organic Ecuadorian farms. The type of soil and amount of rainfall influences each batch’s distinct flavor. Condor Chocolates cannot source cacao locally, but many of the other ingredients used come from nearby sources, including Georgia pecans and local dairy products. The local products made Condor Chocolates a natural fit for Baumgärtner’s store. Community offers a chance for consumers to purchase items that help an independent business, and all of the artisans featured on the shelves. Continued practices of encouraging independent businesses and shopping at locations like Community can positively impact the Athens’ economy, as well as today’s growing number of more health conscious consumers who want to look for unique, sustainable, locally produced products to eat, to wear, and to admire. Holly Roberts is a fourth year majoring in journalism in the Grady College of Journalism and Mass Communication at the University of Georgia. Counties include: Barrow, Clarke, Elbert, Greene, Jackson, Jasper, Madison, Morgan, Newton, Oconee, Oglethorpe, and Walton.